It would be fair to say that French Algerian actor Tahar Rahim hasn’t quite met the lofty expectations placed upon his relatively young shoulders following his towering performance in Jacques Audiard’s breathtaking A Prophet (Un Prophète, 2009). 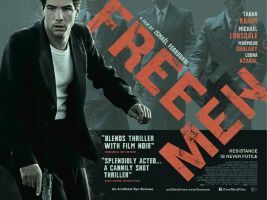 Recent performances in Kevin Macdonald’s The Eagle (2010) and Jean-Jacques Annaud’s Black Gold (2011) have been competent rather than remarkable, but thankfully his latest turn in Ismaël Ferroukhi’s Free Men (2011) represents a marked improvement on past outings. Set in German-occupied Paris during 1942, Rahim plays Younes, a young Algerian scratching out a modest living selling goods on the highly illegal black market. After falling foul of the law due to his affiliation with a revolutionist cousin, Younes is coerced into spying on the capital’s Muslim community for both the Nazis and their French cohorts. His central target becomes singer Salim Halali (Mahmud Shalaby), born of Jewish heritage yet feigning to be Muslim for fear of reprisals. As the SS-lead occupying Nazi forces begin rounding up both Jews and freedom fighters, Younes must decide whose side he’s really on. Much like his inaugural performance as Malik in A Prophet, Rahim’s Younes begins life as a timid, skulking opportunist, unwilling to place himself at unnecessary risk unless the rewards are high. However, as he begins his role of double-agent within the Parisian mosque, his eyes are slowly opened to the hardship endured not only by Muslims, but Jews and other faiths under the ruthless Nazi regime. As is often the case with these sorts of films, a romantic subplot between Younes and undercover freedom fighter Leila (Lubna Azabal) fails to spark into life, whilst another plot strand involving Salim’s repressed homosexuality (on top of his Jewish blood) is similarly hinted at, rather than explored. Ferroukhi seems content to let Rahim’s stray wastrel drift in and out of the lives of others until the day he is forced to nail his colours to the mast. Whilst there is nothing particularly new or remarkable about Ferroukhi’s Free Men – save for a stout, stoic performance by stand-out performer Michael Lonsdale as the Grand Mosque of Paris’ rector Si Kaddour Ben Ghabrit – its narrative is efficiently told and an air of oppression palpable. If nothing else, the film takes us back to an era where Jews and Muslims were far more comfortable in each other’s presence, united against a common enemy, which sadly no longer appears to be the case.